Forest School for Schools and Nurseries. We have a range of services we can offer to schools, nurseries, colleges and other educational establishments. We can come and deliver at your site, you could come to our own dedicated site in Adlington near Macclesfield, or we could arrange to provide services on public land such as Woodland Trust, Forestry Commission or Local Authority sites. 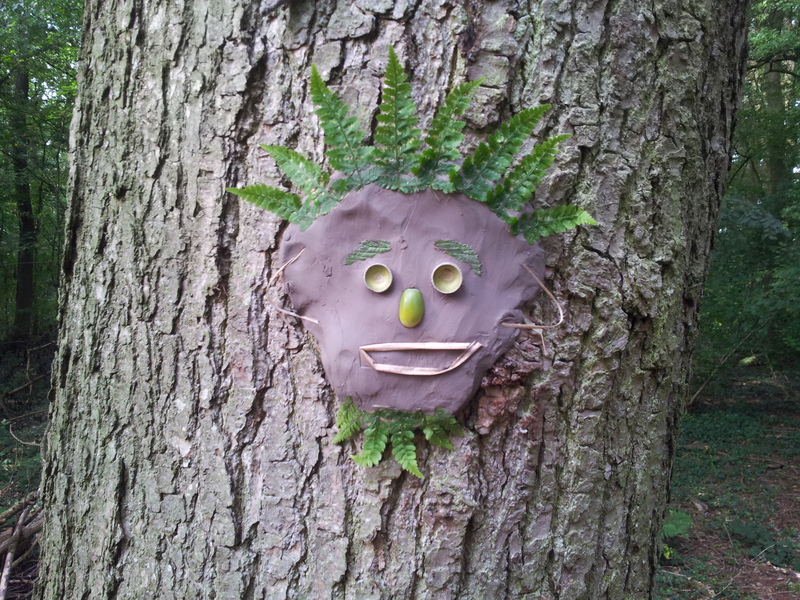 We can deliver programmes of forest school or outdoor learning tailored to your requirements. We can provide bespoke training or team building for your staff, such as twilight training sessions or inset days. We can provide day trips to our dedicated woodland in Adlington. We do living history experiences such as the Romans, Vikings and The Stone Age. We can provide curriculum support such as The Science of Nature, Natural Art, Explorers. Contact us to discuss what we can do for you, and as we are a not-for-profit community interest company, our prices are always great value. We provide forest school services for schools and nurseries as well as run our own pre-school and forest adventure centre. Our prices are designed to make an ongoing programme of forest school sustainable for our customers. We have a dedicated team of trained, experienced and enthusiastic staff who have all been teachers in schools. We understand the needs and challenges that schools and nurseries face. Contact us for more information. Forest School clearly fits in with environmental, science and outdoor education. But it is also about the whole child, their approach to learning and especially about their self-esteem. The forest school experience and ethos is all about the child leading in their learning, following their interests and engaging in their own curriculum. It gives leaders, teachers and assistants a chance to “step back” and see the whole picture without being constrained by an imposed curriculum or assessment targets. Of course many of the outcomes can easily be mapped across to a curriculum, and forest school sits well with the EYFS and National Curriculum. The approach of small achievable tasks and a focus on the process rather than the end product helps develop the child’s personal, social and emotional development. Tasks can be based around creative arts and design, physical development or understanding the world. Questioning, commentary, sustained shared thinking and the use of active learning can incorporate aspects such as mathematics, literacy and communication and language. Forest school particularly encourages children to explore the characteristics of effective learning. The ethos of forest school is that it is child-led, so if a child would rather be doing something else than a particular small, achievable task that is fine, we can facilitate what they would like to do and provide inspiration and support. Forest school can also be linked into the classroom to support class based activities. For example, children could be drawn into a miniature world story in forest school and use their imagination to build a miniature town or city or factory, they could then write stories based on their miniature world. They could make story sticks in forest school and then use them to support their work in the classroom. 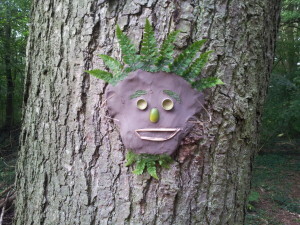 The limit to opportunities to link-in forest school is only capped by our imagination. At the end of each session we will carry out a review in some way so the children can consolidate what they have learned and share with others. Also, at the start of a session we will review what has been covered previously so children can get a good sense of their progress, build on their confidence and have a good starting point for each session. Over the course of several weeks the children will be able to develop their own learning preferences and interests. In time, they should become independent and confident learners. 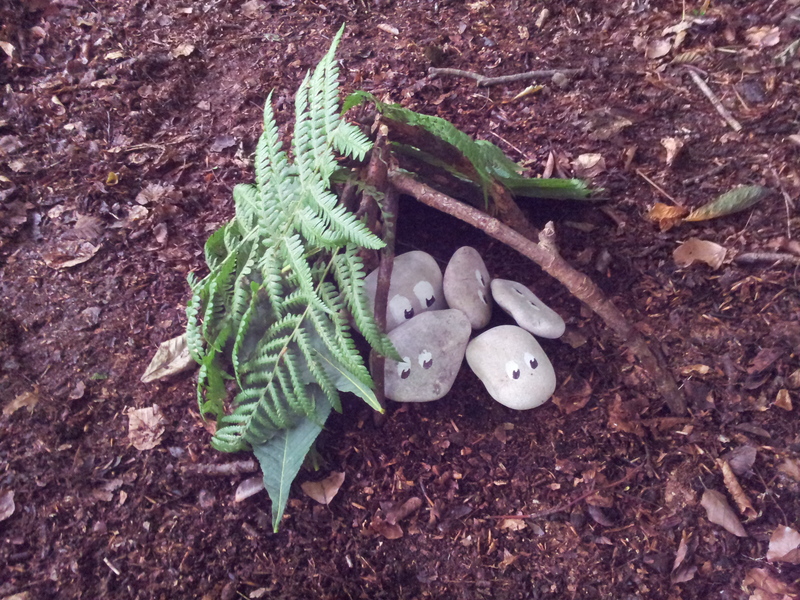 Fairy/teddy bear shelters: scaled down versions of normal shelters. Miniature world: Similar to above with different theme. Animal shelters: learners ‘become’ an animal a make suitable shelter/den/nest. Journey stick: learners encouraged to collect objects of meaning during the session that are then attached to the journey stick, which can be later used as a reviewing tool. Bugs on bushes: place a piece of plastic under a bush/tree. Gently shake and catch creatures that fall out. Broom making: Lash smaller sticks to a larger length of wood to create a basic broom. ‘1,2,3 where are you! ?’ – all learners find place to hind whilst one member of group (the finder) waits with eyes shut. After hiding time up, the finder shouts ‘1,2,3 where are you’ and the hiders reply ‘I’m over here’. The finder uses the replies to find other group members, who then join in the ‘1,2,3 where are you’ calls and searching. Good activity for constant inclusion for all group during task. Activity can linked into prey/predator, shelter, camouflage, etc discussions. Leaf snap: pupils pick set number of different leaves and play ‘snap’ with other group members. Tree height and circumference: construct isosceles triangle to measure distance across ground, which equals to height of tree. Opposite words: Each learner is given a pair of contrasting words e.g. dry, damp…light, dark and have to collect examples of these. Other learners have to guess the given words from their examples. Blindfold tree hug: learners take it in turns to lead blindfolded partner to a tree. Blindfolded person feels/smells tree before returning to start point where they have to try to identify the tree again un-blindfolded. Woodland pallets: learners given area to collect contrasting woodland objects e.g. colour, texture, age. Camouflage corridor: objects foreign to woodland environment hidden for learners to try and visually identify whilst travelling through the ‘corridor’. 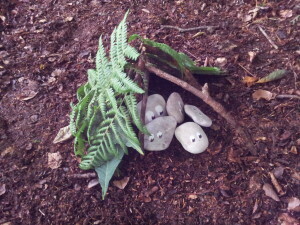 Moles eye view: learners lie on woodland floor to experience the environment from a different perspective. Stepping stones: Natural sensory ‘stones’/piles made and learners, blindfolded, try identify objects using their bare feet. Woodland cocktails: Learners use natural resources to make ‘woodland cocktail’ using cups and sticks as pestle and mortar or cocktail shakers! Visual or smell themes will direct learning. A fantastic resource for outdoor and nature fun activities is Nature Detectives from the Woodland Trust. Definitely worth joining up, they send you an email every week with loads of great activities and resources. More activity ideas are available in this great guide by Forest School Scotland. Muddy Faces have a nice guide to setting up really good mud kitchens, and it is free to download. They also sell really good kit for playing outdoors. There are lots of ideas and resources out there, Google is your friend!